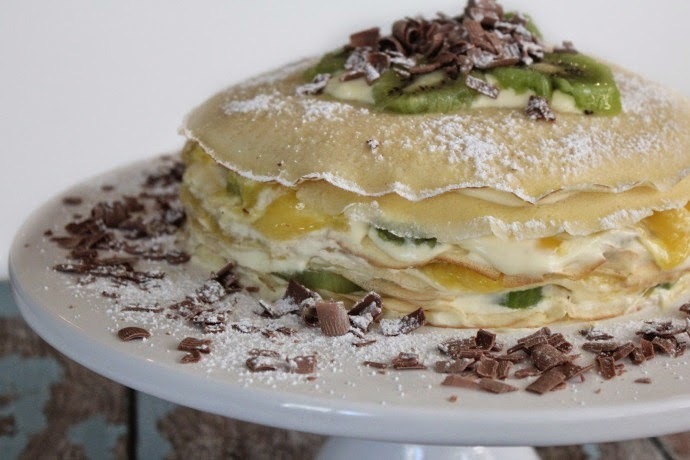 Kiwi & Mango Crepe Cake - You May Stop Laughing Now! 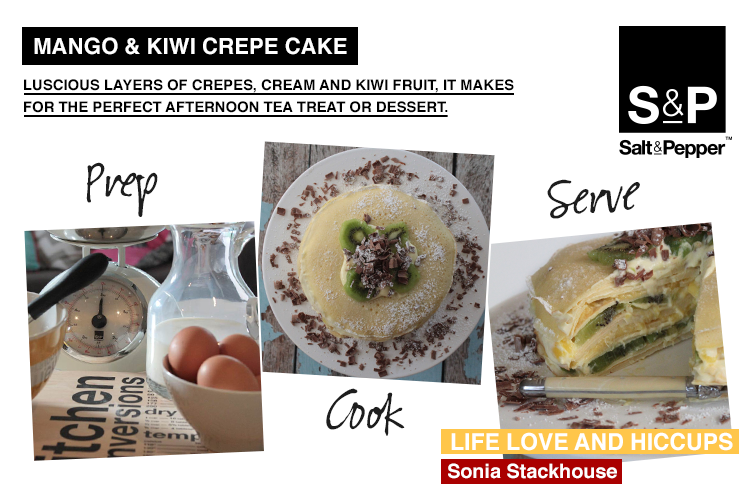 | Life Love and Hiccups: Kiwi & Mango Crepe Cake - You May Stop Laughing Now! 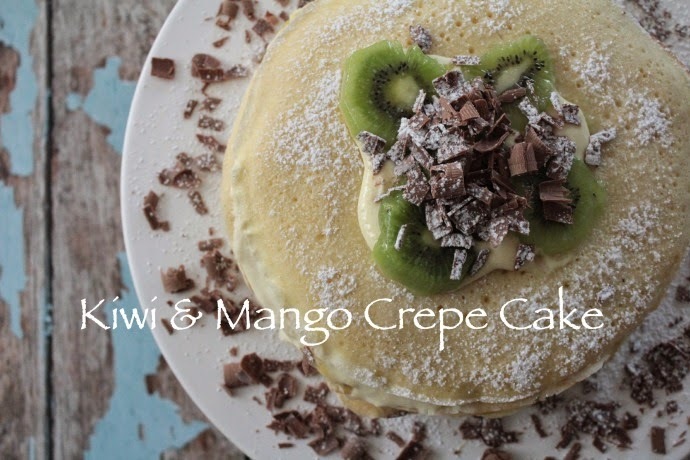 Kiwi & Mango Crepe Cake - You May Stop Laughing Now! OK, so this is probably going to make you laugh. 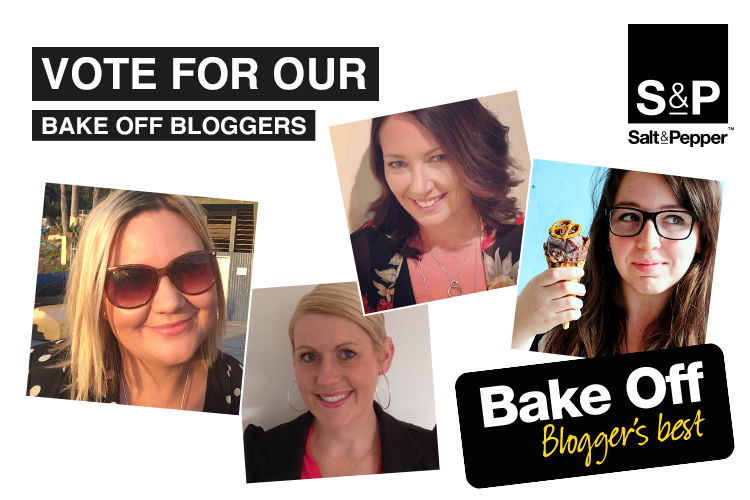 I have been taking part in a bake off for Salt & Pepper along with three other fabulous bloggers - Simone from Honey & Fizz, Yvette from The Stylist Splash and Sarah from the Sugar Hit. That's OK, I will wait whilst you finish snorting and wipe your eyes. The irony is not lost on me either - the self confessed kitchen klutz entering into a cooking competition and all that. Yep funny funny moving on. The thing is I really don't mind cooking all that much. Sure it's not up there on my list of fave things to do, but when push comes to shove I can feed people something half decent - if I do say so myself. That being said, I do go for easy options wherever possible and so that is the theory behind my entries in the bake off. They are all recipes that are easy, taste good and are relatively pain free to make. This is my world famous Kiwi and Mango Crepe Cake. And by world famous I mean everyone in our house likes to eat it. If you are like me and not all that crash hot when it comes to actually baking cakey cakes, then you are going to love this cheats version of a cake. This is a firm favourite with my family and every guest who has even been served this always asks for seconds. Crepes: Combine your eggs, milk, water, sifted flour, butter and salt and beat until the mixture is smooth and runny. In a frypan or on a flat griddle over a medium heat, make 12 large crepes of an even round size. Filling: Beat cream, sugar and vanilla essence until it forms peaks. Putting it together: Start with a crepe on the bottom and layer the top of the crepe with your cream. 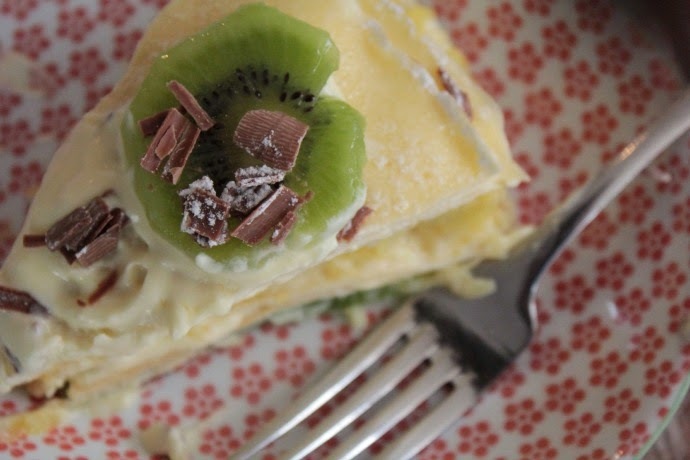 Place another crepe on top, layer with cream and kiwi fruit. 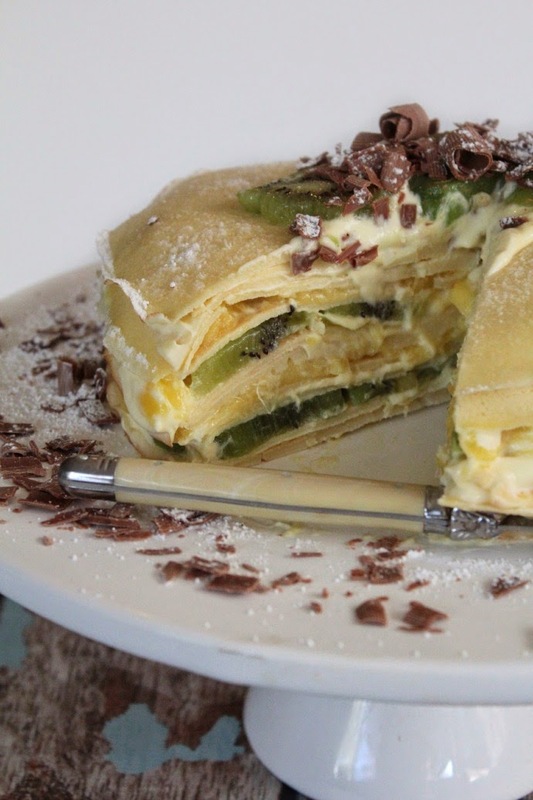 Place another crepe on top and layer with cream and mango. Repeat the pattern with all crepes until you finish with a crepe on top. Place a dollop of cream on top with some kiwi fruit and grated chocolate and generously sift some icing sugar over the entire cake. So the voting in the bake off closes today, so if you are feeling kind of generous, I would love it if you would consider voting for me. It only involves you liking this picture of my Kiwi and Mango Crepe Cake, BBQ Chicken & Rosemary Cheesy Mac or Cinnamon Apple chips on Facebook and that's it. All bake offs and voting aside - you totally have to make this for your family, or for yourself because it's crepes... come on.... crepes! Oh and FYI, I have been known to accidentally on purpose wreck a few crepes in the making just so you know I have to eat them and not let them go to waste and all that. Just saying - chef's perks. What's your trusty tried and true dessert that your family love to wolf down?